(CNN) -- Throughout his career as a television anchorman, Walter Cronkite had a few memorable run-ins with other powerful figures at CBS News, one of his producers told CNN. Walter Cronkite occasionally butted heads with executives at CBS News, his former producer says. Sanford "Sandy" Socolow, who worked at CBS News for 32 years, more than four of them as Cronkite's producer, said Cronkite ran into trouble soon after he took over for Douglas Edwards in the "CBS Evening News" anchor chair. "The suits -- as we used to call them -- went crazy," Socolow told CNN, referring to CBS executives. "From their perspective, Cronkite was sending people to read newspapers instead of watching the news. There was a storm." But that too ruffled feathers, Socolow said. "Salant's attitude was, 'We're not telling them that's the way it is. We can't do that in 15 minutes,' which was the length of the show in those days. 'That's not the way it is.'" Still, Cronkite persisted and that's the way it was from then on. In 1960, in an attempt to emulate the success of NBC's "Huntley-Brinkley Report," CBS tried to make Cronkite and fellow broadcast legend Edward R. Murrow co-anchors at the Democratic National Convention in Los Angeles. But "it just didn't work out," said Socolow, who was then producing for Cronkite. "There wasn't a particular chemistry there." 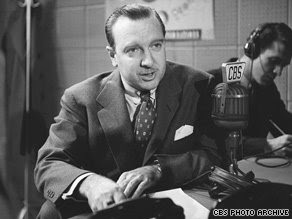 Though the two men were cordial, and it was Murrow who had brought Cronkite to CBS, "they were never drinking buddies," Socolow said. In 1968, Cronkite returned from a visit to Vietnam disillusioned with America's role there. He told Salant what he thought but said he did not want to report his personal opinion on air, Socolow said. Only "after much haggling" did he agree to do so, and not on the regular newscast but on a 10 p.m. special. "To say that we are closer to victory today is to believe, in the face of the evidence, the optimists who have been wrong in the past," Cronkite told his audience. "To suggest we are on the edge of defeat is to yield to unreasonable pessimism. To say that we are mired in stalemate seems the only realistic, yet unsatisfactory conclusion. ... It is increasingly clear to this reporter that the only rational way out then will be to negotiate, not as victors, but as an honorable people who lived up to their pledge to defend democracy, and did the best they could." "He was a purist," Socolow said. "And, a lot of people would say, to a fault, if there can be a fault in such a definition." For example, he said, around the time of the 1979 Three Mile Island accident, in which a nuclear plant's core partially melted, the movie "China Syndrome" was released with a similar theme. "I was so knocked out to its proximity to the events of the day, I arranged a screening for the entire staff of the 'Evening News,'" Socolow said. "He shouted at me, 'I'm not in the goddamn business of selling movie tickets.'" Cronkite even disliked promoting pieces that were slated to run in the next day's newscast, Socolow said. "His attitude being, 'For God's sake, we don't know what tomorrow's news is going to be. How the hell can we take time away from reporting today's news by promoting a story for tomorrow?'" Cronkite departed from the anchor chair voluntarily, Socolow said. "He wanted to retire as undefeated champ, and he made his views known." But Salant, who was also planning to retire shortly, did not want to be the guy who oversaw Cronkite's exit. "His ratings on the day he left the 'Evening News' were bigger than all three network newscasts together today," Socolow said. "He had an average rating of 27 million to 29 million viewers." Salant pleaded with Cronkite to stay so that the decision on how to replace him would fall to someone else. That someone else was Bill Leonard. "On the first day Leonard was in the saddle, Cronkite said, 'Listen, I want to go out as undefeated champion,'" Socolow said. At the same time, then-correspondent Dan Rather's contract was ending and he was being courted by ABC News, Socolow said. "The idea of losing Cronkite was enough to make people gag," he said. "On the other hand, there was the chance they'd lose Rather. What finally happened is Leonard took the opportunity to sign Rather to a contract that was so rich to keep him out of [ABC executive] Roone Arledge's hands that it had to go up to [CBS founder and Chairman] Bill Paley to get an OK on the contract." But Cronkite's departure did not go as he had planned, according to his producer. "The script on his last night said something like, unlike old soldiers who never die, he'll be back every once in a while on an irregular basis when something strikes his fancy -- a handshake deal he had with Bill Leonard," Socolow said. "A very loose deal." But Leonard left the top job soon after, replaced by Van Gordon Sauter, who -- "in cahoots, I think you would have to say, with Dan Rather -- decided they did not want Cronkite on the air, for whatever reason." After he left the anchor chair, Cronkite worked on occasional science and environment pieces on television, but after a few years he rarely appeared on CBS.